Forty-five years after its declaration, several theater productions has been staged about Martial Law, the dark age in Philippine History. With the support from the National Historical Commission Of The Philippines (NHCP), Bantayog Ng Mga Bayani Foundation and DAKILA: Philippine Collective For Modern Heroism, the Philippine Educational Theater Association (PETA) with its mission to use the arts to reflect peoples' stories and to examine our history through artistic and cultural means is staging " A Game Of Trolls. " 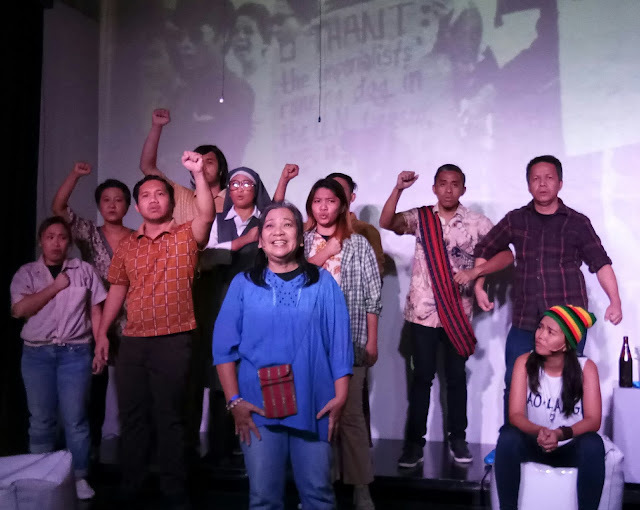 A repeat performance of #aGOT is playing at the PETA Theater Center the whole month of September, the same month when the late dictator Ferdinand Marcos placed the entire Philippines under Martial Law. This musical featuring the concepts of modern day technology and social media is dedicated to the millenials to #NeverForget and # NeverAgain to Martial Law. 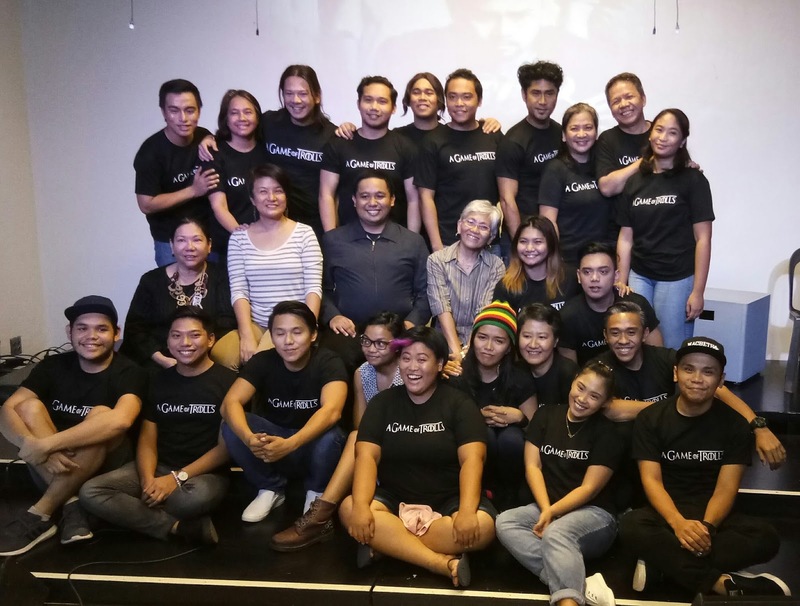 Written by Liza Magtoto and directed by PETA Artistic Director Maribel Legarda, it revolves on the story of Hector, a troll working in a troll center managed by Bimbam. He was later haunted by the visiting ghosts (Martial Law victims) in his clouds and his relationship to Tere, a former Martial Law Activist who taught him to reflect on his beliefs. Myke Salomon and TJ Valderma playing alternately as Hector. Upeng Galang -Fernandez and Gail Guanlao - Billones as Tere. Vince Lim as Binbam. Gold Villar - Lim as Cons. Lemuel Silvestre and Joseph Madriaga as Makisig. Kiki Baento as Jude. Gilbert Onida as Bobby dela Paz. John Moran and Juan Miguel Severo as Eman Lacaba. Norbs Portales as Ed Jopson. Roi Calilong and Jasper Jimenez as Macli-ing Dulag. Ada Tayao as Sister Mariani. The ensemble, Lea Espallardo, Icee Po, Nieves Reyes, Dan Cabrera, Jason Barcial and Justin Castillo. Experience heroism and history as #aGOT runs from 1st to 30st of September 2017 at the PETA Theater Center situated at #5 Eymard Drive, New Manila, Quezon City. Ticket inquiries, please call Ticketworld at 891-9999. Log on to www.ticketworld.com.ph or www.petatheater.com for show buyer information.